The Adelaide Convention Centre opened as Australia’s first purpose-built Convention Centre in 1987. The venue celebrates 30 years in business in 2017 with a fresh new look; its 397 million Australian Dollars (265 million Euros) redevelopment has culminated end of August, with the opening of its new East Building. The completed expansion will see the Centre reborn as Australia’s newest and most flexible convention centre, and boost the venue’s footprint to 20,000 sqm of usable space. One of Adelaide’s convention advantages is the city’s great accessibility. With one-stop connections to 300 destinations around the world, the city centre is just 15 minutes from the airport and home to a lively arts, entertainment and sporting scene, including busy cafés, restaurants and laneways. Once you’ve arrived, there’s little need for transportation; the compact nature of the city makes it ideal for ‘walking’ conferences. In 2017, South Australia was judged one of the ‘Top 10 Regions to Visit’ in Lonely Planet’s ‘Best in Travel’. Adelaide provides a gateway to a variety of unique touring and incentive experiences, and is just a stone’s throw from South Australia’s world-famous wine regions; the unspoilt wilderness of Kangaroo Island; and the Flinders Ranges, the most accessible outback in Australia. Set at the heart of the CBD (Central Business District), the Adelaide Convention Centre is the city’s premier and largest meetings and events venue. With 20,000 sqm of usable space, the Centre is extremely versatile with up to 40 different configurations for events, and can accommodate groups from as small as 30 up to 3,500. In terms of flexibility, the Centre’s design allows it to house events in individual buildings or levels to promote a shared atmosphere. Larger events can enjoy exclusive use of the complete venue, while for smaller events the Centre’s team can provide dedicated zones within each building. Adelaide’s CBD is home to more than 5,000 hotel rooms. For those meeting at the Convention Centre, there is a choice of 3,000 hotel rooms all within a five minute walk, with the Intercontinental situated right next door. Looking ahead, the city currently has an extra 1,500 hotel rooms in development, and is preparing to welcome a series of additional international hotel chains for the first time, including Sheraton, Sofitel, Langham and Atura. Adelaide is centrally located within Australia and supported by a growing flight network, with direct flights to Asia and the Middle East, and one-stop connections to 300 destinations around the world. Among the major international airlines flying into Adelaide are Cathay Pacific, Singapore Airlines, Malaysia Airlines, Emirates, Qatar Airlines, China Southern Airlines, Fiji Airlines and Air New Zealand. Within Australia, there are fast, frequent and affordable connections to and from all major domestic destinations with the major domestic carriers Qantas Airways, Virgin Australia, Jetstar Airways and Tiger Airways. Once you’ve arrived, the city centre is conveniently located just 15 minutes from the airport. Do you offer any special services / assistance for associations? 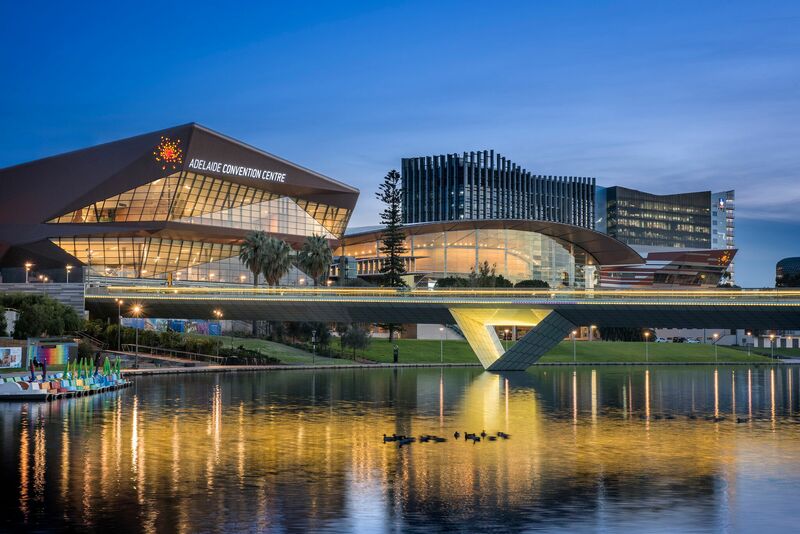 Over the past 30 years, the Adelaide Convention Centre has carved a global reputation for excellence and service. The Centre prides itself on working as a ‘partner’ with event planners to deliver winning events, and wherever possible, employs a flexible approach. For medical-related or themed events, the Centre is conveniently situated adjacent to BioMed City, one of the largest health and life sciences clusters in the Southern Hemisphere. The Centre’s team has worked hard to form a strong alliance with the precinct to add value to conference programs, and is able to facilitate connections with local thought leaders, innovative industry and research bodies, and academics; to conduct site tours, share ideas, and gain access to key speakers. This approach is all about enriching the conference experience, both within the Centre and the city itself. The Centre is also a proud ‘Team Adelaide’ partner, and can connect you with the Adelaide Convention Bureau and the South Australian Tourism Commission who can help develop destination itineraries, showcasing the best the region has to offer.